European gas hub markets are maturing. Consistent with this maturity is an emerging liquidity in traded gas options. This enables us to undertake an interesting analysis of the evolution of historical vs implied volatility. European gas hub markets are maturing. This can be seen via the increase in range and liquidity of traded products. Growth in trading activity is focused on the UK NBP and Dutch TTF hubs, with TTF challenging the traditional dominance of NBP. Consistent with maturing hub markets is a growing liquidity in traded gas options. There has also been growth in the penetration of shorter term flexible capacity products which contain embedded optionality (e.g. gas storage capacity). This means that gas price volatility is becoming a more transparent driver of value in energy portfolios. In today’s article we look at two different volatility benchmarks (historical and implied). We also do a practical comparison of the evolution of these benchmarks over the last three years and consider their impact going forward. If you are familiar with these measures of volatility feel free to jump ahead to the next section. Historical volatility involves a retrospective calculation based on observed market prices over a defined period in history. It is a statistical measurement of the realised price dispersions of a specified contract over a specified time period. For example: “Day-Ahead volatility in Apr 2015 was 55%”. Historical volatility is measured based on a dataset of realised historical price return observations. The wider the distribution of historical price returns, the higher the volatility measurement (and vice versa). The level of volatility expected by the market can be ‘implied’ from the prices of traded gas options. For example: “the Jan 2014 ICE NBP gas call option contract has an implied volatility of 50%”. The key to being able to imply volatility from traded asset prices is that the level of volatility is an input into the standard pricing formula (e.g. Black Scholes) used to value optionality. Option prices are a function of strike price, underlying gas price, time to expiry and volatility. So if the price of an option is known, then implied volatility can be backed out using the option pricing formula. The key advantages of historical volatility as a measure are its transparency and objectivity. There are minor variations in the way that historical volatility is calculated, but it represents a relatively simple and accessible statistical measure. EnergyStock, the Dutch fast cycle storage operator, has recently started publishing a volatility dashboard which contains a set of historical volatility indices on TTF gas prices. The dashboard provides a new and useful source of data on rolling and annual indices for the TTF day-ahead and month-ahead contracts. Publication of reliable volatility indices is an important step in developing market liquidity in products with embedded optionality. Gas traders need middle office sign off in order to do any transactions. And middle office in turn require an independent & objective volatility benchmark for P&L and risk measurement calculations (either as a simple input to benchmark the value / risk of vanilla option portfolios or as guidance for stochastic parameters required for more complex flex valuation models). Most speculative trading companies (e.g. hedge funds) do not permit traders to take exposures in a market until there is an established objective risk benchmark. Robust implied volatility benchmarks have only recently emerged in the European gas market. The reason is that the meaningful measurement of implied volatility requires a critical mass of traded option liquidity. Implied volatility indices are well established in the oil market (e.g. the CBOE OVX index). But it is only over the last 3 to 4 years that gas options liquidity in Europe has supported the measurement of implied volatility. The advantage of implied volatility over historical volatility is that is represents a current (forward looking) market view on the level of volatility. As such, reliable implied volatility data is highly valued by traders and risk managers. Gas options price data is harder to come by than straight gas price data (used to calculate historical volatility). Marex Spectron, Europe’s leading gas options broker, has been developing a comprehensive dataset* covering volatility surfaces for key NWE hubs. ICE also publishes an implied volatility surface for the NBP and TTF hubs but the Spectron surfaces more accurately reflect the current market. This is because they include option bid / offer data where as the ICE implied volatilities are only based on the traded option prices on the exchange (some of which can be quite stale given sparse liquidity across some strike / maturity combinations). We have used this dataset in the next section to run a numerical comparison of historical vs implied volatility. This comparison provides an interesting illustration of the different characteristics of historical vs implied volatility. The most obvious initial observation is that implied volatility is generally higher than historical. This is because implied volatility incorporates a risk premium (reflected in the option price) as well as capturing within day price movements (historical volatility is calculated off a single end of day price). Chart 1 also provides some interesting examples of how the two measures of volatility react to market events. Take the March 2013 NBP gas price spike as an example. The reaction of implied volatility to market events is immediate. 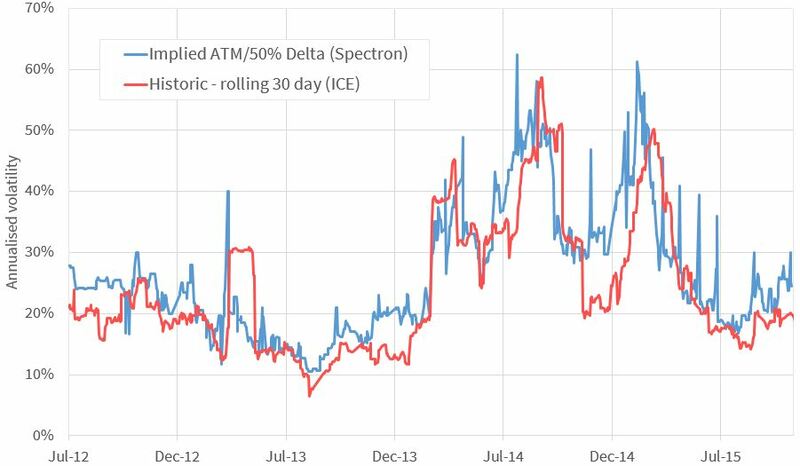 The prices of options rise as risk premiums increase as can be seen with the spike in implied volatility in Mar 2013 on the chart. The impact of a market shock on historical volatility is more delayed as it feeds through the historical gas price series used to calculate volatility. A jump in implied volatility can disappear as quickly as it came. This can also be seen in Mar 2013 where implied volatility rapidly returned to previous levels as new supply was diverted ensuring the market impact was temporary. The historical volatility series however averages in the impact of the price spike as long as higher gas prices remain in the historical 30 day price data window. These characteristics do not necessarily mean implied volatility is a more reliable measure. Implied volatility represents an expectation of average volatility up until expiry, so can fluctuate significantly closer to contract expiry. Implied volatility is also dependent on the consistent availability of reliable options price data. Limited data over a given period can produce spurious changes in volatility. Implied volatility benchmarks can be of limited use as a source of direct input data for complex pricing models. These models can require a number of non intuitive parameters far beyond simple implied volatility benchmarks (limited to standard option products). For example, a gas storage model may use spot volatility, mean reversion and price jump diffusion parameters to describe stochastic price behaviour. There is no clean method to generate these parameters from a single monthly implied volatility benchmark. As the European gas market continues to evolve, understanding the impact of volatility on asset value will become increasingly important. European energy portfolios have large underlying exposures to the level of gas price volatility. For example flexible volume customer contracts, pipeline swing contracts, storage capacity and transport capacity all contain embedded optionality, the value of which is driven by volatility. The evolution of the benchmarks we have referred to is providing increased market transparency on the level of gas price volatility. Take a look at other more mature commodities markets (e.g. oil & metals) for an indication of the way forward. Gas hub prices are already firmly ‘on the radar’ of most industry participants. Gas price volatility levels are soon to follow. *For more information about the Spectron implied volatility data please contact Richard Frape.